When Olivia was two, her favorite movie was Despicable Me, which she fondly referred to as "FLUFFY DIE!" (Her version of the line "It's so fluffy I'm gonna die!") So for her birthday we had a FLUFFY DIE party! It was such a blast! 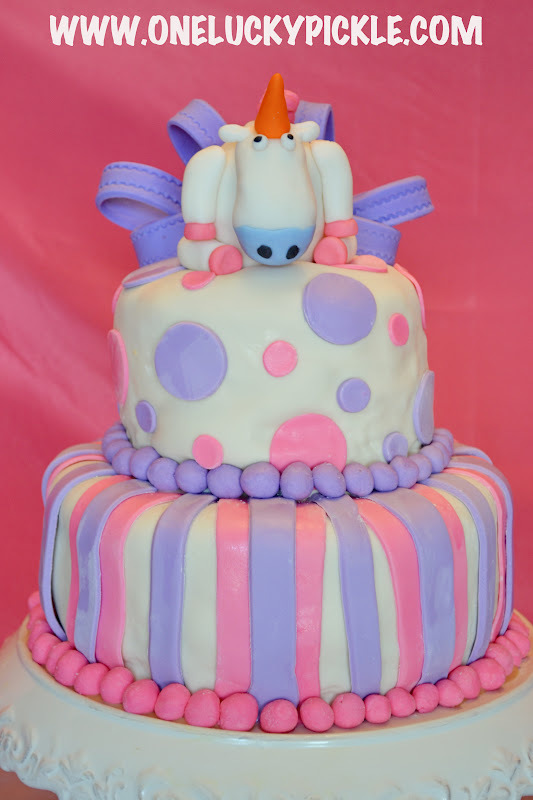 Here's her "Fluffy Unicorn" cake. 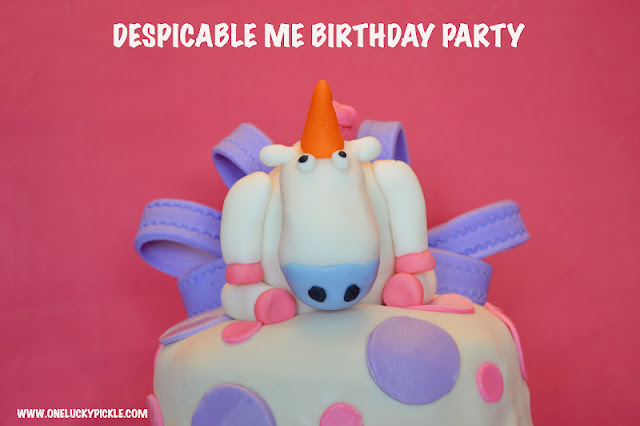 The unicorn was super easy to make out of fondant. Does anyone need a fondant tutorial or is it pretty self explanatory? Don't look too closely at the rest of the cake, I used a strange recipe for the frosting underneath the fondant and halfway through the evening it melted- causing gross tumorous looking growths to appear on the cake. Note to self- don't use anything but a nice thick buttercream frosting when working with fondant. Whenever I asked Livy what kind of cake she wanted she always responded "Ummm... a pink cake... uh.... a purple cake... a white cake... a chocolate cake." So demanding! I tried my best to live up to her expectations. As you can see the cake is purple and pink, and the two layers are coconut (white) and chocolate. She was thrilled! I giggled the whole time I put these together. They were so much fun! 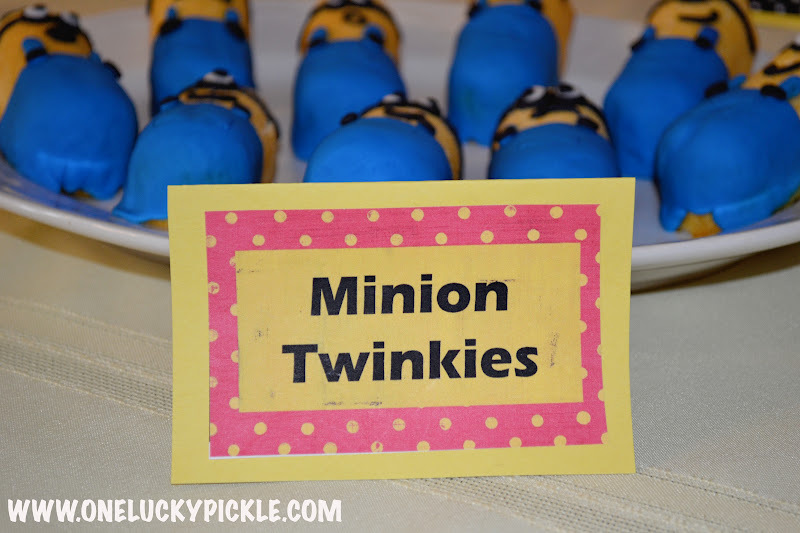 Just Twinkies and fondant. Remember what I said about labels? Use them. Love them. 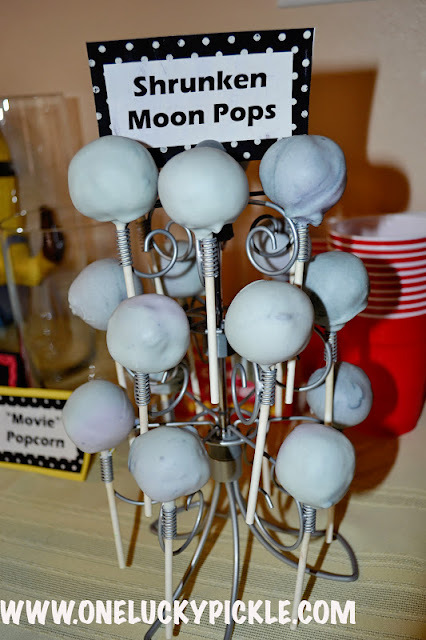 They are so easy, and yet seem to give your party that "super mom" effect. What's a movie party without a snack bar!? We had jars of tasty snacks, Livy's signature drink- chocolate milk, and lots different kinds of popcorn. I love putting things in vases or jars for presentation. It adds such great dimension to your food table. And last but not least- Shrunken moon cake pops. 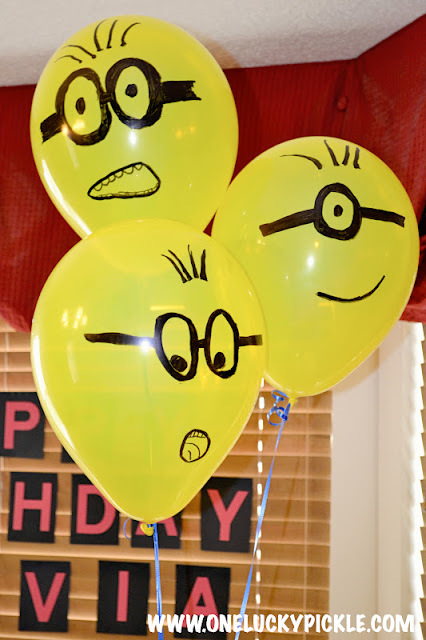 Minion Balloons or in Livy language- "Fluffy Loons"
Again SO easy to do, and they add SO much to the party! Treat bags for the kids to use to collect their goodies. We ate stuffed crust pizza, just like the girls do on the movie. We played ball with an inflatable moon that I just happened to have from my years of teaching 3rd grade science. After dinner it was time for the Minion hunt! This game was a huge hit with the kids... and the adults! Livy's birthday is right around Easter so I just gathered up lots left over plastic eggs for this project. 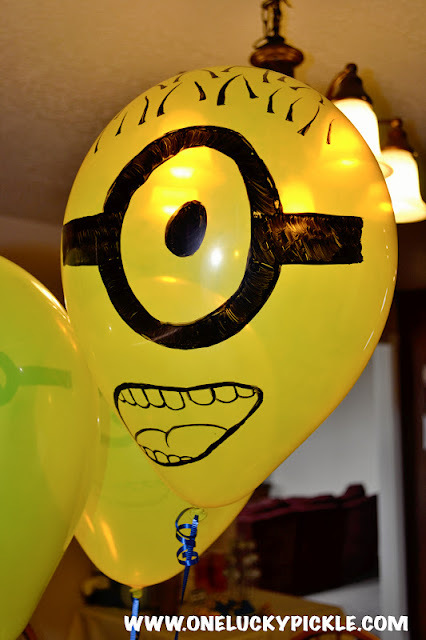 I used the yellow tops and the blue bottoms and a little bit of Sharpie magic to create some hilarious little minions. Addie checking out her loot. To make the hunt a little more interesting, I hid a picture of our birthday girl inside one of the eggs. Whoever found an egg with a picture of Olivia got an extra prize. The kids frantically opened their minion eggs to see if they were the lucky winner. Here's Livy trying desperately to figure out how to wack the "Fluffy" unicorn pinata. And last but not least, we played Pin the Minion on the Moon. Even some of the "older kids" got into it! I had to show you this, because it's just too cute. It's a FLUFFY UNICORN! Addie and I found this at a local toy store. We made a voice box to put in it that says, "It's So Fluffy I'm Gonna Die!" I think this was one of my favorite parties I have ever thrown. The minions are such easy characters to incorporate! Pinata- FREE - I already had it on hand. It's been used like 4 times. I just keep patching it up! Minion Eggs- FREE - I just gathered leftover plastic Easter Eggs from family members who didn't want them. But I noticed they were on clearance the week after Easter anyway. You can get them pretty cheap. 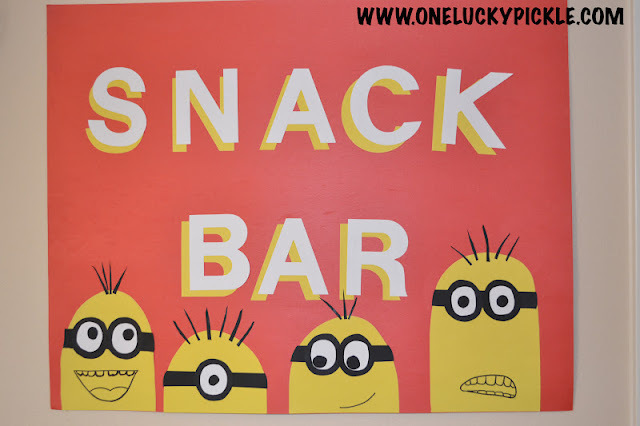 Snack Bar Food- Appx $4.00. Popcorn is so cheap to make! We had tons leftover too. Oh my love. Those minion twinkies are adorable! 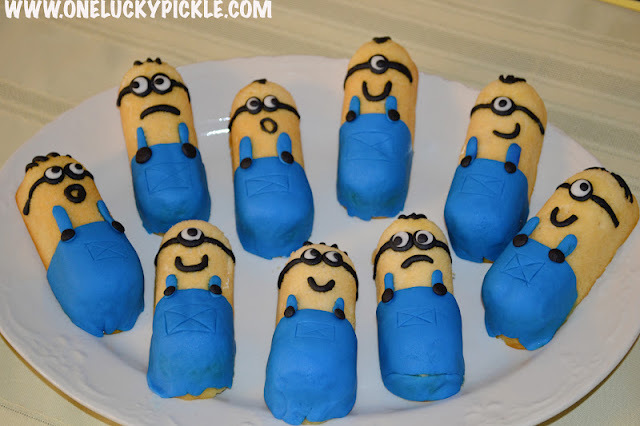 I for one would love a tutorial on fondant. I made it once and it was a mess. It was with marshmallows and powdered sugar. Yours is always perfect and adorable! Both the Yellow Brick Road party and this one are SO CUTE!!!! Way to go!